How much do the mega blueberries plants cost? You can get 2 plants for $15 plus shipping and handling. Currently there is a special of 3 plants for $15. Does my order from mega blueberry come with any type of guarantee? 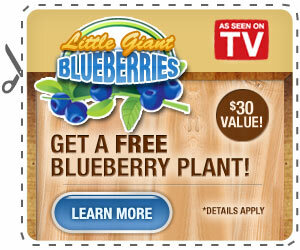 Per the mega blueberry website, all orders come with a 30-day money back guarantee. Shipping and handling is $7.95 total for the first two plants and $4.95 for the additional 3rd plant. What comes with my mega blueberry order? You will receive the number of blueberry plants you order as bare-root cuttings, without soil. Can the mega blueberry plants be grown inside? All blueberry bushes can be grown inside but for blueberry bushes to thrive and produce the maximum crop of blueberries they need to be planted outside. What kinds of blueberry plants is the mega blueberry company sellings? They are the Vaccinium Corymbosum kinds. Also known as the highbush blueberry. Once receive how long will I have to wait before my plant starts producing blueberries? If you care for your mega blueberry bush properly you are likely to get a small batch of blueberries this year with the overall crop increasing each year thereafter. Blueberry bushes can get very large in size and the larger they are the more blueberries for you. These perennials, if cared for properly will come back year after year and once mature (in a year or two) they will provide you with a very large amount of blueberries. How much sun do the mega blueberry plants need? Blueberry plants are generally a full sun plant. You can get away with mostly sun, but the more sun the better. How often do the mega blueberry plants need to be watered? They should be watered whenever the soil feels dry. The goal here is to keep the soil slightly moist at all times. Once more mature they need less watering and less care. What time of the year should I plant the mega blueberry plants? Typically blueberry plants do very well in cold temperatures but when starting with a new blueberry plant like the ones you will be getting you should wait until you don’t expect anymore freezing temperatures. If you already have your plants you can pot them and place them in a window that gets a lot of sun while waiting. Once established, these blueberry plants do well in all sorts of temperatures ranging from well below 0 to around 100 degrees. Is there a phone number or email address for contacting mega blueberry? You can call the mega blueberry customer service line at 1-800-805-1215.